The super-string theorists tell us that everything is just vibrating strings. 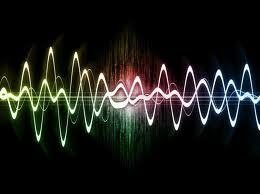 We are all just vibrations, everything is a frequency, a melody in the grand symphony of the universe. Get your head around that one Pilgrim! I do love it when sober-headed physicists talk like besotted mystics. If you play music, you know all about vibrations. If you play a stringed instrument, you spend lots of time tuning those strings. Tuning is a subject that expands and gets more complicated the more you look at it. That note you’re tuning to is not a particle, it’s a wave and it’s not something you can put in a box. The closer you listen, the more you hear, the less you know. Some notes are pleasing, some notes go well together, some notes are displeasing, and don’t go together. But it all depends. Western music, Eastern music, modern dissonance. What is music? What is noise? It’s all in the ear and the brain of the hearer! And what’s pleasing and displeasing may hold for other species too. We live with two Cockatiels and a Parakeet and Puccini, U2, The Beatles even The Rolling Stones seem to agree with them. But late John Coltrane, Nine Inch Nails, Metallica, and The Who, well, not so much. It seems like tuning should be simple. But it’s not. There are all kinds of methods to get you to “standard tuning,” but there’s lots of disagreement on how standard, standard really is, and there’s many ideas about how to make your instrument sound pleasing to the ear. You can tune up, and one chord sounds great, and another sounds off. Or you move up the fret-board and some notes are sharp or flat. If you have perfect pitch, like my friend, Mr. Mo Ukulele Raconteur, well a flat or sharp note, a poorly-tuned instrument, a badly-sung note can drive you to distraction!